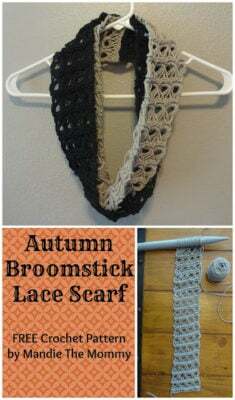 I love the two colors in this broomstick lace scarf. It almost looks like a reversible scarf with them overlapping as shown in the above image. The scarf is worked in a bulky yarn, thus making it quick to whip up. And that means you can make several in time for the cold season. In addition to the bulky yarn, you will need a 9mm crochet hook and a 25mm knitting needle.